Change Your Mind! | New T’s Added to the Shop . . .
TLBP Change Your Mind Ts, Tanks and sweatshirts available now! Click the image or the shop link above . . .
Hey guys! I’m so excited to share my latest endeavor with you! I’ve been designing T shirts for myself and some of my friends for a few years now. With their encouragement, I have decided to make them available to you as well! I have just added two different designs to the shop, and I will be adding more designs regularly. Getting these designs into the shop, and getting the shop up and running has been something that has been carried over from To Do list to To Do list for some time now (um, like at least a year now . . . jussayin) It’s been rolling around in the back of my head for so long, and it feels good to release it out into the world. Birthing ideas has never been an easy breezy process for me. The ideas come to me relatively easily, but my perfectionist tendencies sometimes keep me from progressing at the speed I would like. I always want things to be just right . . . I want the shop to look a certain way, I want to have a shop stocked with lots of designs, I want the designs just so… but this past year has taught me a valuable lesson that I think I have shared with you before . . . I created the “change your mind” T as a way to remind myself that much of what we experience in life is filtered by our personal experiences. Sometimes the filter is good and sometimes it’s not so good. Really, its just a matter of changing our minds about the way we approach situations. It all depends on what we are filling our minds with daily. It’s a process for me, so I welcome little reminders here and there. I was inspired to create this shirt after spending some time studying Romans 12:2. It’s a powerful scripture that has really helped me to keep my thinking on track. Changing your mind is a process. But I love this phrase because it’s a two fold sentence that makes it sound so simple. It really is just a matter of changing your mind . . . over and over again until you train it. My vision is clear and I am on the path to realizing it, I’m so glad you guys are along for the ride. In the meantime, you can visit the shop by clicking here or the “shop” button on the menu above to snag yourself a sweatshirt, T or tank. This entry was posted in fashion, Inspiration, Personal Style and tagged Change Your Mind, Romans 12:2, T shirts, thelookbookphiosophy.com on February 12, 2015 by thelookbookphilosophy. My Uniform . . .
As much as I love fashion and trying new things, I realized something as I was getting dressed this morning. I love a good uniform. By uniform, I mean that I have learned what types of clothes look good on my body type, and what types of clothes I feel most comfortable and powerful in. Oftentimes my choice of dress depends on the types of activities staring back at me from my TO DO list that day. But generally, I gravitate toward one of my many uniforms when selecting what to wear. One of my favorite go-to outfits is a great pair of skinnies, an off the shoulder shirt, heels and a great bag. Oh, and a stack of bracelets and rings. Works for me every time. I always feel ready to take on what life has to offer in this uniform. Heels really do that for me. I never really feel dressed enough, unless I am wearing a pair of heels… of course that depends on where I am going and what I am doing that day. I’m not the type to shop in heels or even run errands in heels, but when I’ve got somewhere else to go, they give me life. So does a great bag. I’m really into big slouchy bags and soft cross body bags right now. In the image above I am carrying my Allegra Hobo in chocoloate suede. I love her because she has these great gold rivets on the handle and fringe with gold bells. I love a little movement in my clothes. So, what is your favorite YOU-niform? Share in the comments below! This entry was posted in Accessorizing, fashion, Personal Style and tagged Allegra Hobo, Ayanna Listenbee Handbags, fashion, heels, Jessica Bennett, personal style, skinnies, style, thelookbookphilosophy.com, uniform, uniqlo on October 22, 2014 by thelookbookphilosophy. Last Week in Claremont Village . . . .
It’s been so hectic the past few weeks leading up to Christmas, that I didn’t do much posting. I hope you all had wonderful holiday celebrations with your families and friends. Last week I did some last minute shopping in Claremont Village and we snapped a few shots. The weather was cooler (which of course I LOVED). I’m hoping we get back to cooler temps around these parts again soon. Hope you are all enjoying this holiday season. What are your plans for New Years? This entry was posted in Accessorizing, Ayanna Listenbee Handbags, fashion, OOTD, Personal Style and tagged fashion, style on December 27, 2013 by thelookbookphilosophy. ‘Tis The Season! Gettin’ My Tree On . . . The winter season is in full swing here in Cali. I have been loving the chill in the air and that underlying sense of excitement and expectancy that I always feel in December! The holiday’s are rapidly approaching. I had an amazing birthday week and a nice Thanksgiving with friends and family and now we are looking ahead to Christmas. This week we are traveling to Austin Texas for my niece’s college graduation. I’m so excited to A. take a road trip and B. spend time with my family. Yesterday we finally got our Christmas tree. I had been debating whether or not to get an artificial tree, since we were going to be traveling for a week, but I can not imagine the house not having that evergreen smell @ Christmastime!!! For me, artificial = convenience, (and I’m all about convenience) but I feel like I would be jipping my kids! Growing up, part of the Christmas excitement & tradition was going out and selecting the tree. So, we are keepin’ it real for now! Anyway, in keeping with the spirit of the season, I thought the tree lot would be a great place to snap a few outfit shots!! Don’t you just love when the weather allows us to change gears and pull out all things cozy! This entry was posted in Ayanna Listenbee Handbags, fashion, Handbags, Personal Style, Style and tagged Ayanna Listenbee Handbags, Christmas Trees, fashion on December 9, 2013 by thelookbookphilosophy. OOTD: Leopard + Ripped Denim . . .
Have a happy + safe Halloween!!! This entry was posted in Current Trends, fashion, OOTD, Personal Style, Style, Stylespriation on October 31, 2013 by thelookbookphilosophy. How to Get Where You Want to Go . . . SEE IT!!! This entry was posted in Personal Style, Style, Stylespriation on October 9, 2013 by thelookbookphilosophy. Yesterday was a lovely overcast day with intermittent drizzle. Just the kind of wintry day I adore. I prefer to spend that kind of day by the fireplace, snuggled on the couch with an awesome read, or a devilish Joan Crawford movie. Unfortunately, I think I can count on one hand the number of times I have actually done this since I’ve had my kids! I spent the morning in Reston’s classroom, volunteering and observing on the sly. It seems my “shy” son is a talker in class . . . well, as his teacher puts it, a “quiet whisperer.” I didn’t catch him in the act, but I did love being able to watch him in his environment. He definitely inherited the shy gene from his mama. I hope he will grow out of it, though I have yet to grow out of it myself. However, I am much, much better than I used to be, and after many years of fighting it, I am finally OK with the fact that I am an introvert! After class, I had to run out to my contractor’s to drop off sketches for a new bag. I am hoping to have the sample completed to take with me to Vegas this weekend. I always have to try out my bags for a few weeks after they are made to see what I like and don’t like about it. It’s also a great way to see how the bag wears and what the gen pop thinks about it. Well, I’m off to meet a good friend of mine for a brainstorming breakfast. Have a fabulous Wednesday!!! 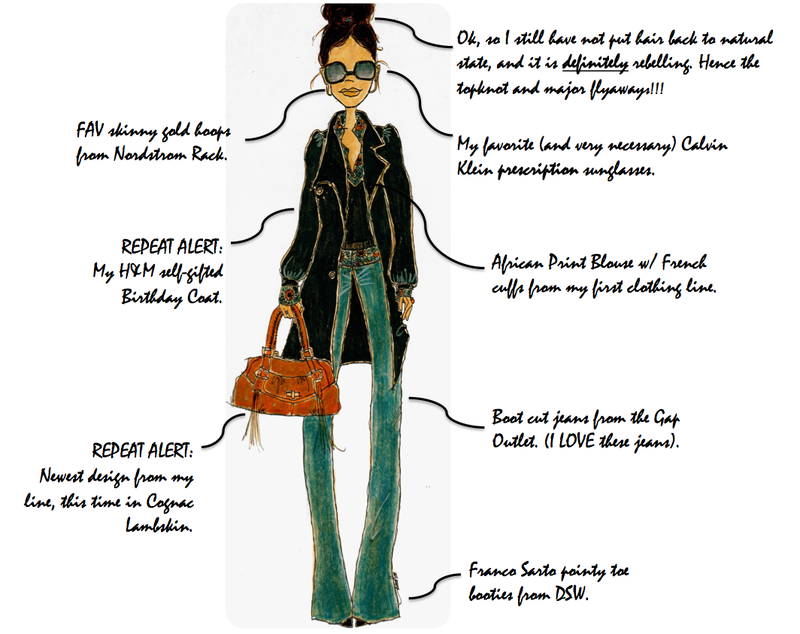 This entry was posted in fashion, Personal Style, Personal Style Illustrations, Style, The Worn Identity and tagged First grade, introvert, Joan Crawford, Shyness on February 8, 2012 by thelookbookphilosophy. The Worn Identity: Greek Salad With a Side of Jazz! This weekend my Mom performed at a local Restaurant and Bar in Encino. Rob and I drove out to support her and were treated to a night of good music and yummy Mediterranean food. (I am a sucker for Greek salads and Shrimp Kabobs). My mom is a jazz singer and performs monthly at different venues. I am really proud of her. She has always loved to sing, but in recent years she has really begun pursuing her dream. I love the fact that she has never let her dream die, and after raising my brother and myself, and retiring from a tiring job, she now has the time and energy to further feed her passion. Are there any dreams in your life that are dying to be fed? 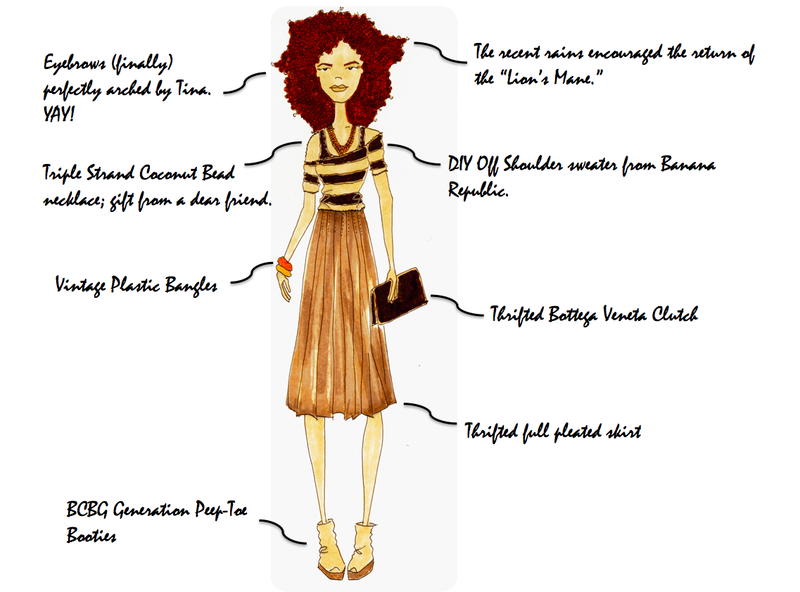 This entry was posted in fashion, Fashion Illustration, Personal Style, Personal Style Illustrations, Shopping, The Worn Identity and tagged Banana Republic, BCBG Generation, Bottega Veneta on January 31, 2012 by thelookbookphilosophy. Destination: Kid’s Birthday Party . . . 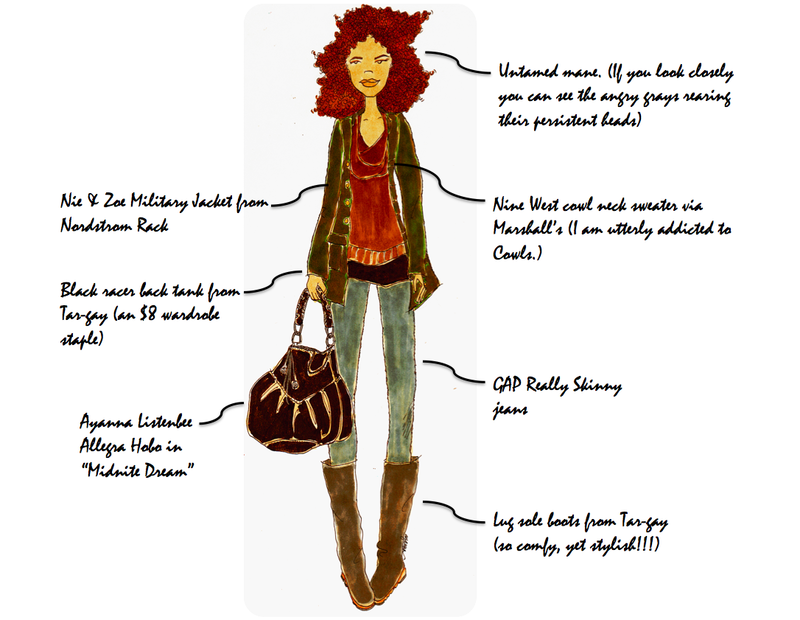 This entry was posted in Personal Style, Personal Style Illustrations, The Worn Identity and tagged Cupcake Wars, DSW, Gap Outlet, Nordstrom Rack, shopping on January 24, 2012 by thelookbookphilosophy.